No matter if you are playing sports or enjoying the outdoors, this durable classic is the watch to have with you. With its easy-to-read digital display, stopwatch features, and illuminating light, it is perfect for any activity. 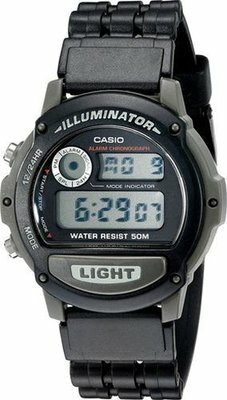 The Casio Illuminator sport watch also features a daily alarm, hourly time signal, and auto calendar. This black and green resin watch will keep you up to date down to the second, with display features for day, date, 12/24 hour, minutes, and seconds.